Can 3 simple words guide the way to business success? Why is everything so complicated these days? Do you think propositions across many industries seem to become ever more complex and difficult to deal with? Welcome to my new blog and to the Roger Edwards Marketing website. Now that my garden leave from Bright Grey and Scottish Provident is over I’m now in business to help you. So it makes sense for me to blog about the things I know most about – marketing (both strategic, product and promotion and content marketing), social media, copy writing, public speaking and protection insurance. And so back to all that complexity. Necessary regulation causes some of it. Bureaucracy gone mad in companies causes most of it . I get really angry when such bureaucracy stifles innovation or prevents companies from doing simple and exciting things. And I’m sure you do too. Which is why I want to focus on helping people simplify their propositions in future; not just their products, but their marketing as well. Every week I listen to a podcast by an Canadian marketer called Mitch Joel (check it out it’s called Six Pixels of Separation). It’s very insightful and relevant to marketing across all industries. In his New Year podcast he declared the three words that he will live by in 2013 and the idea appealed to me. – See more at Six Pixels of Separation. (Click here to TWEET this). We should strive to make everything simpler for customers and advisers across propositions, products and processes. Many industries are necessarily complex and I think clients are crying out for less complexity. Good content is increasingly important for all businesses. It can mean website copy, videos and podcasts on the one hand and booklets, policies and letters on the other. Is your content bringing you customers, and winning you business? If we are to grow our business we need to experiment with new ideas. This might mean putting a special price into a segment of the market, or piloting a new proposition before mass roll out. The key to experimentation is to learn and grow with each initiative. I believe that in an increasingly complex and bureaucratic world success means we must simplify our propositions and messages, create amazing content and experiment with new marketing tactics to grow our businesses. Do you despair with the complexity that surrounds you? What have you done to make things simpler for your customers? 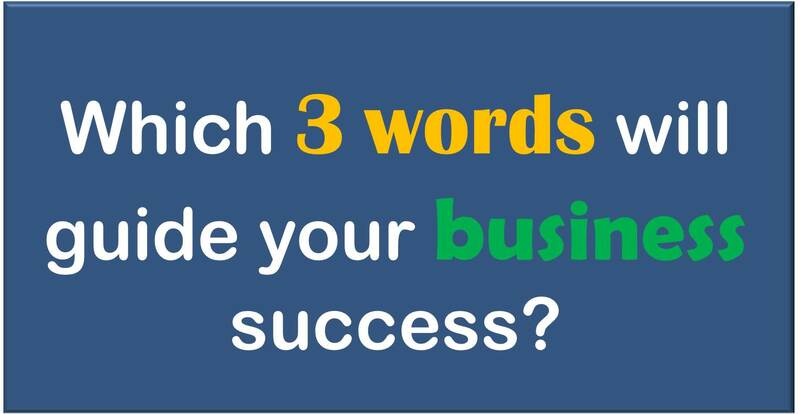 If you had to come up with three words to describe your approach to business success what would they be? Please share your thoughts by leaving a comment below. Just received your “three word” question while grabbing a five minute lunch-break. You’ll know that I’ve spent 30 years working out how to get the best possible advice about care options to the right people at the right time. My very first client stood out – at 86 he wanted to be able spend more time with his girl-friend and get some help looking after his 106 year old mother. The lady who was worried about her memory, as at 85 she was beginning to forget lines of Shakespeare. The 91 year old man who wanted to move to a nursing home so that he could better run his business. Respect : people of great age have often lived extraordinary lives with stories and experience to share. Optimism: there is always a future, no matter what age we are. A purpose for living the next day. Time: Time to listen. Time to understand a client’s wishes. Care advisers at Grace are chosen because they are great listeners. But I’m not sure I could have given you the three words unless you asked, and I had a moment to reflect. So thanks for that. Thanks Chris, great to hear your 3 words. It’s a excellent little exercise for businesses of any size. Hope we catch up soon. Well, great start with the new blog, Roger. Not the first time you’ve got me shouting YES at the screen. For my top three, have to go with Simpler too, and in my case, Humanity and Trust are 2 and 3. Great stuff Ruth. I do think that finally there is a growing opinion that things are too complex and need to change. Interesting. I’ve just compiled a ‘3 simple words’ mailshot as I’m certain no-one reads most of the guff we send out. Thanks Lynda. I’d love to see the mail shot if that was possible.